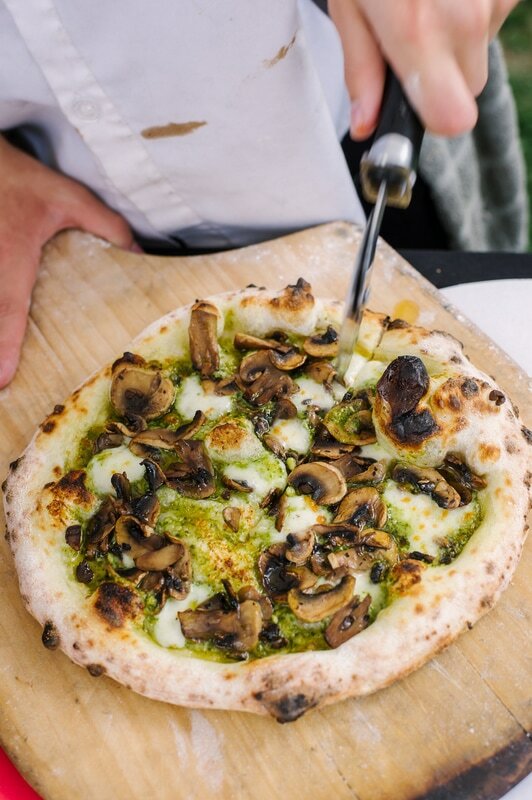 Neapolitan pizza as we know now originated in Naples in the late 19th century, when a local pizzaiolo served Italian Queen Margherita, a pie in the colors of Italy’s flag: green basil, red tomato, white mozzarella. Since then, pizza has undergone an infinite number of makeovers. We prepare Neapolitan pizza the old fashioned way, as it would have been done centuries ago. The dough is composed of four ingredients: water, flour, salt, and yeast, the last in the form of a natural starter. After a long and slow cold fermentation process, this process helps to develop gluten and flavour. Our pizzas are baked in a 3000 pound Le Panyol Camelot oven, burning exclusively apple wood, lilac wood, hard maple & oak to reach and maintain temperatures in excess of 900 degrees F ; at such high temperatures, liquid water in the dough vaporizes instantly, expanding within tiny bubbles already formed by the yeast to create a puffed and delicate outer rim, the raised crust is typical of this style ~ flamed kissed delicate dough. Pizzas cook in 60-120 seconds, yielding a final product that is soft and supple, not dried out and crunchy as is often the case with other styles of pizza. Blistered but pliable, chewy yet delicate, a perfectly cooked Neapolitan pizza unites these seemingly opposite qualities under a tradition that is equally paradoxical: humble yet exalted.